We will teach you how to build your own furniture as well. We have just had a delivery of new Fairy Garden furniture and accessories! 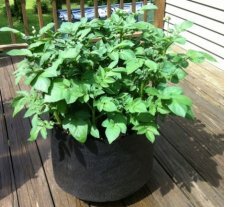 Growing potatoes in a container ...easy! There is nothing more delicious than an heirloom variety new potato, grown in your own backyard, and if you haven't tasted a home grown potato then you you are in for a total treat. Like tomatoes the taste and texture of fresh potatoes are very different from those you buy in the supermarket. By growing your own potatoes, you also have the opportunity to plant unusual varieties that are hard to find. 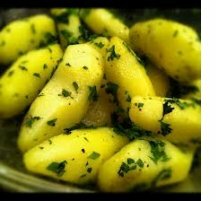 1) Potato starters: You need to buy seed potatoes. The commercial varieties you buy in the supermarkets have been sprayed to prevent them from sprouting and will not grow well. Here at Deep Roots we have three varieties of already sprouted seed potato: Russian Banana Fingerling, French Fingerling, and Red Thumb, all delicious and all sold in 4 ' pots for $2.99. 3) Potting soil: Use a high quality, organic potting soil mixed with an organic, slow release fertilizer such as Dr. Earth's All Purpose Fertilizer, or Bone Meal. 4) Sun and Water: Potatoes will not grow without sun and water. You will need at least 6-8 hours of sun a day. Your potatoes also need consistent water to grow. You want to keep the soil moist, not wet. If the soil is too dry the plants will die. If it’s too wet, the potatoes will rot. If the moisture level is inconsistent, your spuds will be misshapen. Check the soil moisture level often and when you do water, make sure to water deeply - until water runs out the bottom of your container. 5) Method: * Place 4-6 inches of potting soil/fertilizer mix in the bottom of your container.... that's right only 4-6 inches, no more. * Place your pots of sprouted seed potatoes on top of the soil, pressing them in slightly. The plants will grow fairly large so make sure to give them some breathing room. Two or three pots of sprouted seed potatoes in an 18' container will give you a bigger harvest than you would think possible. * After you have planted your sprouted seed potatoes, cover the stems with potting soil/fertilizer mix up to a few top leaves. * Water well. One of the keys to growing potatoes is keeping your soil moist, not wet. To check moisture level, stick your finger into the soil at least an inch or up to your second knuckle. If it feels dry, water. Check at least once a day. 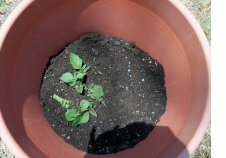 If it’s very hot, and or windy, you may have to water your potato container gardens even more than once a day. Make sure to water deeply, until water runs out the bottom. It is counter productive to just water the surface of the soil. 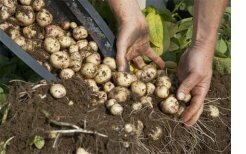 * Once your potato plants have grown around six inches more above the soil, you are going to “hill" them by adding a couple of inches of potting soil/fertilizer mix around the stems. Be careful not to break the plants while doing this. Don't worry if you cover some of the bottom leaves. You want at least 2/3 of the plant with its leaves to be sticking out of the soil. * You’ll want to repeat this process of adding soil/fertilizer a few times more as your plants grow until your soil reaches the top of your container. Potato plants grow breathtakingly fast, so keep an eye on them and don't let them get ahead of you. then to see how well they are doing. It's Spring... What to do in your garden this month... If February is the crossover month where winter turns to spring, then March means spring is in full swing. The days are getting appreciably longer and deciduous trees and plants that have been dormant during the winter are pushing out bright green leaves and shoots. There is no better time than NOW to plant, transplant or sow seeds, as plants are botanically programmed to grow fast in the spring. There is lots to do in the garden this month so roll up your sleeves and enjoy it! Pull weeds and snails: Even though we haven't had much rain this year, weeds still grow and slugs and snails are emerging from their winter hideaways hungry as ever. Water the ground before pulling weeds and then use a pre-emergent such as Preen to prevent weeds from germinating. Hand pick snails off your plants just before dawn. Locate their daytime hiding places ― usually strap-leafed plants like daylilies or agapanthus ― and handpick regularly. Use a snail bait such as Sluggo, which is safe in the vegetable garden and around pets or children. Now is an excellent time to sow spring veggie seeds. 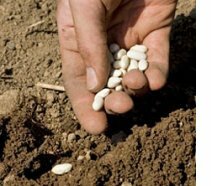 If rain is forecast, (and there is still time for rain to come...) sow vegetable and annual flower seeds before it arrives. Nothing excites seeds as much as rain! The art of getting seeds to germinate is to prepare the ground first and keep the seeds moist while they germinate. Do not flood them but do not let them dry out either. Buy tomato plants: Tomatoes grow well in the ground or in large pots. Tomatoes need heat to produce flowers and fruit, but during these early months they will develop a large root system that will make for stronger plants in the summer. At Deep Roots we have several varieties that have been adapted to our coastal climate. We will be bringing in different varieties of heirloom tomato plants with each shipment so check back often for exciting varieties. 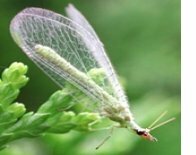 Attract good bugs: To keep insect pests under control in your vegetable garden, lure in their natural enemies ― hoverflies, lacewings (photo left), ladybugs, and parasitic wasps ― by planting the nectar plants they love, such as aster, chamomile, coreopsis, cosmos, feverfew, marigold, scabiosa, and yarrow. Grow fruit trees: March is a great time to plant citrus trees. If you have limited space plant dwarf varieties which grow well in large containers. Grow citrus trees in FULL SUN. Citrus trees thrive in sun and heat so growing them in full sun is especially important along the coast. Prepare the ground or the container well, sprinkle some Dr.Earth Fruit Tree Fertilizer in with the soil before you plant. Citrus trees are heavy feeders and need regular fertilizing to produce flowers and fruit. For more information see the article on the right. Start an herb garden: Plant chives, parsley, cilantro, arugula, rosemary, sage, savory, tarragon, thyme, and my all time favorite herb - Winter Savory. Arugula, chervil, cilantro, and dill can also be grown successfully from seed. Acidify hydrangeas: To keep your blue-flowered hydrangeas blue, acidify the soil now and every few weeks until bloom time. If you don't do this the hydrangeas will revert to pink. Apply aluminum sulfate, which is often packaged expressly for hydrangeas, following label directions. 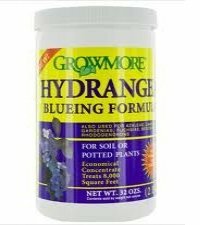 At Deep Roots we have Growmore's Hydrangea Blueing formula in stock now. Feed plants: Almost all plants appreciate added nutrients at this time of year. They are just about to begin a growth surge and, like a runner before a marathon, they can use the extra food. Feed fruit and ornamental trees, shrubs (except camellias ― wait until after bloom), lawns, container plants, houseplants, perennials, ground-covers, and annuals that have been in the ground for six weeks or more. If rain is forecast get out into the garden and fertilize everything with a slow release granular fertilizer and soil conditioner such as Gro Power and let the rain soak it in. What To Plant: Plant warm-season annual flowers and vegetables (tomatoes, peppers, marigolds, petunias ) and citrus and other sub-tropicals. Once the soil has warmed to 60 degrees F, sow seeds for corn, cucumbers, green beans, squashes, and other heat-lovers. 60 degrees F means the soil is warm enough for you to walk on it comfortably barefoot. Continue to mow your lawn: Mow fast-growing lawns regularly and at the right height. It's the best thing you can do to control weeds and keep grass thick and healthy. Now, during cool weather, mow cool-season lawns such as bluegrass, rye-grasses, or fescues at 2 inches or so. During periods of hot weather set the mower at 3 inches. Mow warm-season grasses such as Bermuda, St. Augustine, and zoysia at 2 inches throughout the growing season. Containers: Plant colorful flowers in containers to brighten up your entryway or the view from your family room. Mix in some slow release fertilizer (such as any of the organic formulations by Dr. Earth) with the soil before you plant. Good plants for long term bloom include nemesia, calibrachoa (Million Bells), Osteospermum (African Daisies), and geraniums. Fertilize these regularly, too, with a half-strength fertilizer, or Osmocote. Harvest Regularly : Keep picking your cool-season crops, such as peas, lettuces, and spinach. It will encourage more production. Continue to plant successions of these fast-growers for production over the next several weeks. Mulch: Replenish mulch where it has disappeared and add a layer to new areas so that it's 2-3 inches deep. Mulching well helps to prevent weeds from taking root and helps to conserve water in the soil so you don't have to water quite as often. Be careful to avoid mounding the mulch against the stems or trunks of your plants. Fuchsia: Cut back fuchsias that have become leggy as they bloom on new wood. Houseplants: Start feeding houseplants again.Repot if necessary. Move houseplants outdoors or out from protected spots once the weather warms up a little. Wash them off with a gentle shower of water. Keep them outside for the summer in a shady spot. Too much sun will scald the leaves. 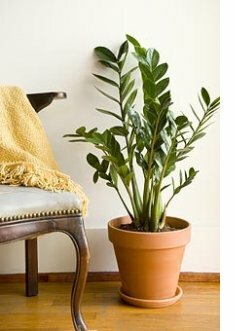 One of the most common requests at the nursery is for a houseplant that doesn't need a lot of light, water or care. The ZZ plant (left) fits the bill perfectly. Requirements: Plant in a soil mixture that drains easily. Avoid moisture-retentive soils. Let the soil dry out between waterings. Will grow happily in low light situations. Now is the time to plant strawberries. 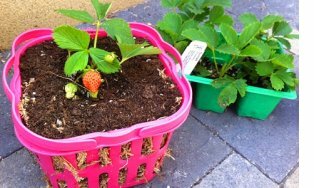 Plant them in the ground or in containers - the more you plant the more strawberries you will have! Strawberries are so well-suited to container gardening that there are pots specifically designed for growing these vining wonders, however I have seen strawberries successfully grown in all sorts of containers including wooden crates, plastic laundry baskets, and buckets with a hole drilled in the bottom. 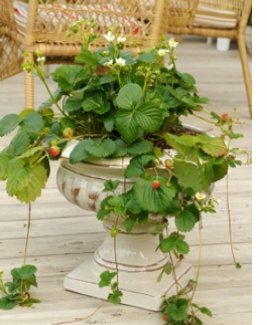 As vining plants, strawberries are also happy in hanging planter baskets. The key is to keep them evenly moist throughout their productive months. Hanging pots, because they’re not protected from the elements, tend to dry out more quickly than planters on the ground. The advantages to hanging pots are that they don’t take up space on the ground, and they’re also more resistant to pests such as aphids and spider mites. Determine a spot for your container that will get at least 6 full hours of sun each day. Also, strawberries require a rich potting soil and regular moisture. Use a good controlled release fertilizer once a month, and then a little more often during flowering and throughout the fruit-bearing season. Strawberries will produce profuse blooms if you use a high phosphorous fertilizer. Sequoia - Everbearing. One of the best tasting berries ever. Sequoias are medium in size and produces lots of huge, sweet fruit over a long period of time. This variety grows well in California. To avoid flowering and fruiting stress on young plants, flower buds should be removed in the first year. Removal of flowers will allow the plants to direct their energy toward establishing a root system and developing a healthy, large leaf canopy to fuel next year’s crop. Chandler: June-bearing. The Chandler Strawberry plant is a high yield variety that produces medium to large, beautifully wedge-shaped juicy fruit with exceptional flavor for a three-week period in spring and early summer. The Chandler Strawberry is a favorite for making jams and jellies or freezing due to its high yield. The Chandler Strawberry plant is excellent for coastal areas. Ozark Beauty: Everbearing. Ozark Beauty strawberries can be considered the best of the ever-bearers. They yield abundant crops from spring to late fall. Ozarks yield tastier, deep red, firm berries just right in sweetness. So productive that a single mature plant is capable of producing more than 200 blossom, buds, and berries. We suggest holding runners to 2 or 3; fewer runners mean larger berries and total yield will be bigger, too. Temptation Everbearing: These everbearing plants produces strawberries all year. Excellent winter hardy plants, just mulch during winter. This variety grows well in containers and hanging baskets too! A variety that are almost entirely without runners. Camarossa: Everbearing. Early season.The Camarosa strawberry is an early-season short day, productive cultivar. The fruit is larger and firmer than Chandler, very flat and conic, very firm with a good flavor, and is widely adapted producing fruit over an extended period. Can be used for processing. Berrie Basket: (photo left) Everbearing. 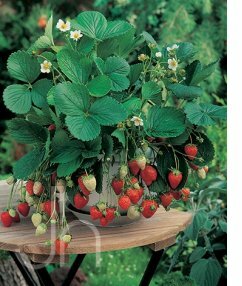 Berri Basket strawberries produce large red berries on compact, bushy plants. The compact habit makes this variety great for hanging baskets so you can have fresh strawberries on your porch or patio. Be sure that your basket or planter gets 6 hours or more of direct sunlight. The white flowers stand out on the shiny green foliage making these plants attractive as well as a good source for fruit. 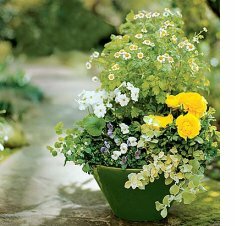 Try Berri Basket in hanging baskets and let it trail down. In a couple months, you can expect to begin harvesting deep red berries continuing until frost. Berries ripen about 30 days after first bloom. For the best-tasting berry, pick them a day or two after the whole berry turns red. Remove all ripe berries because overripe, rotting fruit will encourage diseases and insects. In our climate strawberry plants are short lived perennials, which will usually produce reliable crops for about three to four years before needing to be replaced. On March 17 we are all Irish so they tell me... 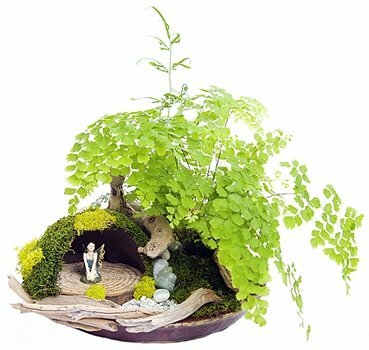 If you are not up to wearing green all day decorate your home or garden with a beautiful green or bronze Oxalis (often also know as shamrock). This pretty plant is non-invasive and grows well in part sun with a long bloom time. From Monday March 18th our opening hours will be 9AM - 6PM daily. Our award winning Floral Design Studio is situated at the southern end of our parking lot on the corner of 2nd Street and Sepulveda. Look no further for all your Prom boutonnieres and corsages; Easter, Mother's Day or Grad bouquets and arrangements! We also provide custom arrangements for weddings, parties and events. Our unique, one of a kind floral arrangements are created to your specifications by our talented team of designers. Each photo links to an individually themed galley of arrangements. New photos are being added just about every day. 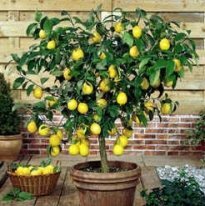 Citrus trees need a pot that is at least 18 inches tall and wide, preferably bigger. I have grown a dwarf Meyer Lemon in a pot that was not 18 inches wide, but it was stunted and fruit production was not as good. This is because citrus trees have roots that spread out close to the surface. In a citrus grove you’ll often find tree roots growing in the leaf litter below the tree. 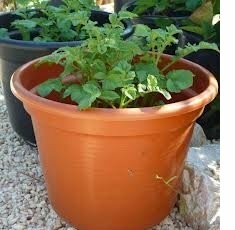 Select a pot with thick walls, clay pots are ideal. Citrus do not like the super-heated soil found in metal pots. You’ll need to gently root-prune and re-pot every 5 years or so. You should water your tree often enough so that the soil only briefly dries out between watering. If the soil is already wet, do not add any more water. You must allow the fruit to ripen on the tree. To tell if the fruit is ripe, pick one and taste it. You can’t tell if the fruit is ripe by rind color, as most varieties color quite some time before they are ripe. Simply put, you don’t need to prune your tree at all. Pruning will not improve your harvest. Lower branches produce the most fruit, so definitely don’t cut those off. Prune lightly for aesthetic reasons and to remove any dead or diseased branches. I have grown citrus trees in pots for several years now and my advice is "Fertilize! Fertilize, Fertilize!" Citrus trees in pots really need lots of fertilizer. Nitrogen is your citrus tree’s best friend. Fertilize monthly from February to November with a high-nitrogen fertilizer according to package instructions. If the leaves are deep green with burned tips, you’re fertilizing too much. Citrus are also very sensitive to soil that is too alkaline, a problem for those of us in the South Bay. If you see light green leaves with dark green veins, you most likely need to re-acidify your potting soil with some soil acidifier (sometimes marketed as a hydrangea blueing agent). Because fruit is the result of pollination between plants, many kinds of fruit trees produce the best harvest when they have a similar type of tree nearby to cross-pollinate with. Most citrus varieties, however, are self-fertile. Which means they don’t need a partner to produce offspring. This is good news for small-space gardeners because it means you don’t need to waste space with a second tree. Kumquat. 'Nagami Kumquats produce fruit that look like tiny, oblong oranges. They are usually tart, and the fruit is eaten skin and all. Lemons Lemons are a great choice in areas with summers that aren't hot enough for other types of citrus. They especially enjoy coastal areas, and will produce fruit year round near the beach. 'Meyer Lemon' is the best variety for container gardeners. The fruit is sweeter with thinner skins than regular lemons thanks to the fact that is actually a lemon-orange hybrid. Other dwarf lemon varieties currently in stock are 'Eureka' and 'Pink Lemonade'. Mandarins: Some varieties of Citrus reticulata are called tangerines, while others are called mandarins. If you choose a variety that produces seeds, get only one citrus tree. When there are two trees they will produce more seeds. 'Gold Nugget' produces fruit that is seedless, very sweet, and easy to peel. Also in stock - 'Darcy Mandarin'. Oranges These need more heat to produce fruit so make sure you put the tree in a spot that gets all day sun. We have ‘Washington Naval' and 'Lake Lane Navel' as well as 'Valencia' and 'Moro Blood Orange' semi-dwarf orange trees. Other citrus in stock: 'Rio Red' Grapefruit, 'Star Ruby Red grapefruit, and Minnesota Tangelo. CSA Boxes -Not just a box of vegetables! 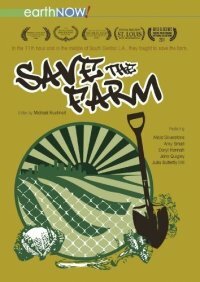 The farmers of the South Central Farmers' Cooperative who grow the vegetables in our boxes have a powerful and compeling back story that can be seen in two documentaries - the Oscar nominated "The Garden"
families and community and created an urban oasis for more than 14 years. A recent battle over the ownership of the land and the right of the farmers to cultivate it is eventually lost, the farmers are forcibly evicted and have to watch as their carefully tended oasis is bulldozed and left abandoned. 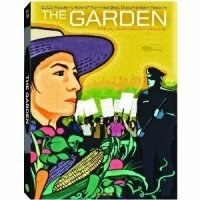 Both movies are available on Netflix and are powerful commentaries on property rights, local government and people power. These farmers now cultivate donated land in the Central Valley and bring us fresh vegetables every week. Support these valiant people and buy a box of organic, seasonal vegetables. If you can commit to three boxes so much the better. Once a month? Twice a month? Every week? the choice is yours but once you have watched these movies you will want to support these people in. Spring is springing and longer days with warmer temperatures means we can once again sit outside and enjoy a cocktail or an alcohol-free beverage. Whereas you can't (legally) "grow" your own alcohol you can grow some of the other ingredients for a refreshing libation. Fresh, fresh, fresh...you will hear mixologists talking about fresh ingredients all the time. 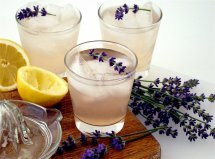 Using fresh squeezed juices, garnishes at their peak and fresh herbs make otherwise "decent" cocktails spectacular and you cannot get any fresher than growing your own fruits, vegetables and herbs in your own garden. 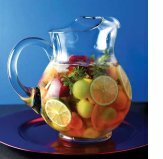 If you browse the thousands of cocktail and punch recipes available on the web you'll see numerous possibilities for garden fresh mixers and garnishes. If you enjoy gardening anyway, there's no reason not to design a portion of your plantings around your drinking preferences. Planting a Bartender's Garden is just one more way to get the most out of your outdoor space. Tomato - choose medium sized, juicy varieties for a Bloody Mary, Bloody Maria, etc. Strawberries are not the only fruit that can be successfully grown in containers. Blueberries do extremely well in pots because they prefer an acidic soil which can be more easily monitored in containers. The varieties we currently have in stock are Jubilee', 'O'Neil', Sunshine Blue, Misty and Southern Highbush. Dwarf citrus varieties also do well as long as they are in full sun (see article above right). Fruit that prefer to be in the ground: blackberries, raspberries and grapes and full-or semi-dwarf sized fruit trees. Currently we have grapes, full sized and dwarf avocados, semi-dwarf peaches, plums, apples, apricots and fig trees. The only product that seems to work is Bayer 2 in 1 Systemic Rose & Flower Care. It’s a combination of systemic pesticide and fertilizer which should strengthen the plant against further attacks. Not organic, but sometimes compromises need to be made to solve the problem. This product is also useful in controlling the caterpillars that eat the buds on your geranium flowers, the aphids on your roses, in fact any insect pest on NON-EDIBLE plants.